Sundays and Mondays are my days off. My Fiance works on Mondays so its kind of my day of alone time. On these days, I find myself either playing in the kitchen all day, or running errands all over the city, that we haven’t had time to do during the week. Today was one of those days where I have been in the kitchen since I rolled my lazy self out of bed. I have been preparing some baked goods to trade for Massage and Acupuncture treatments at work. While my Apple Cake was in the oven (I’ll write about the cake tomorrow), I decided to make myself lunch. 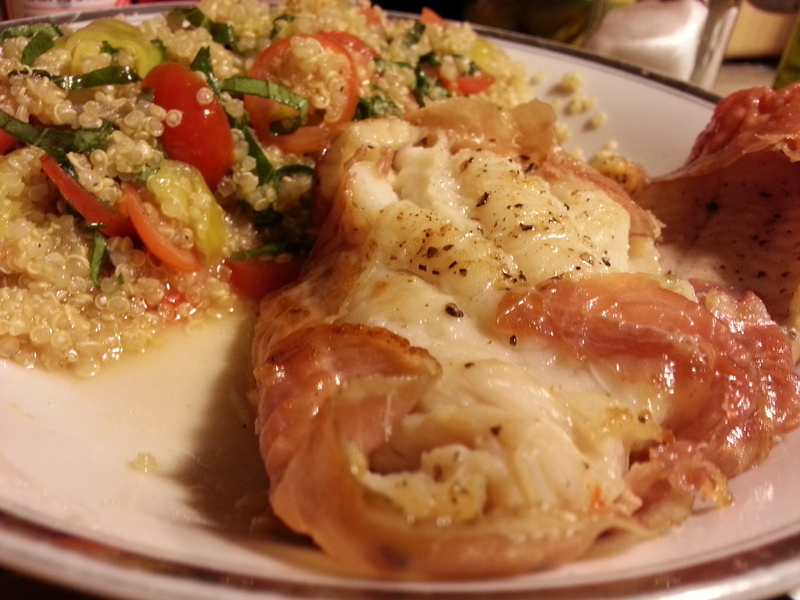 Prosciutto Wrapped Dover Sole, with warm Quinoa Salad. Now, I know that most people don’t keep prosciutto in the their refrigerator, I just happened to have some left over from our Charcuterie Plate (Cured Meats and Cheese) dinner last night. This lunch doesn’t take many ingredients or much time. Cook the Quinoa in the Vegetable Stock. Remember, you cook Quinoa like rice, 2:1 liquid to grain ration. Bring it up to a boil, then reduce to simmer and cover for 8 – 12 minutes. Toss the Quinoa with the Tomatoes, Peppers and Basil, add the vinegar and olive oil and salt and pepper to taste. Salt and Pepper the Sole fillet, then wrap it in the Prosciutto. Heat a non-stick skillet and sear the Prosciutto wrapped fish on each side for about 5 minutes. This past weekend, my fiancé and I travelled to Southern California for our Wedding Shower that was being thrown for us by my family. Now, when I am on vacation, I tend to throw my “good girl” diet brain out the window. I eat what’s offered to me, what sounds, looks, or smells good, and whenever I feel like it. This weekend was a celebratory weekend to top it all off. My father, who like me, enjoys feeding people, made an ambitious menu of Hawaiian inspired fare (the shower was Luau themed). The menu included Hawaiian pulled pork, sausage and meatballs in a sweet and sour orange sauce, cocoanut shrimp, rice with pineapple and macadamia nuts, BBQ beans, Teriyaki chicken wings, Hawaiian Coleslaw, potato salad, macaroni salad, and a variety of other snacks. Oh, and lets not forget the chocolate fountain. Yes, that’s right. A CHOCOLATE FOUNTAIN. So perhaps I went a little overboard this weekend. 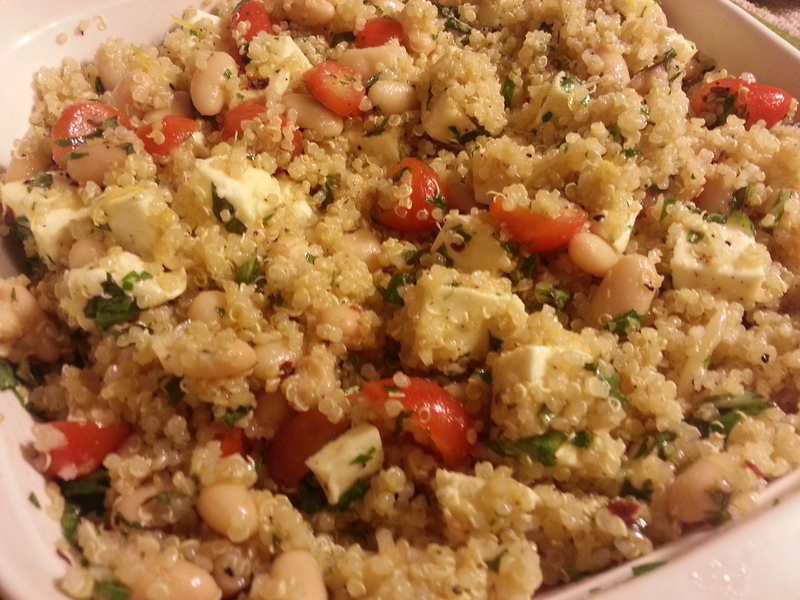 It is because of this, and the inspiration I received from work to come up with a light and nutritious recipe for the summer time, I am sharing this wonderful cold quinoa salad. I know I posted a quinoa recipe in my last post too, and it was also Italian inspired, but this one is different and equally tasty, I promise. 1. 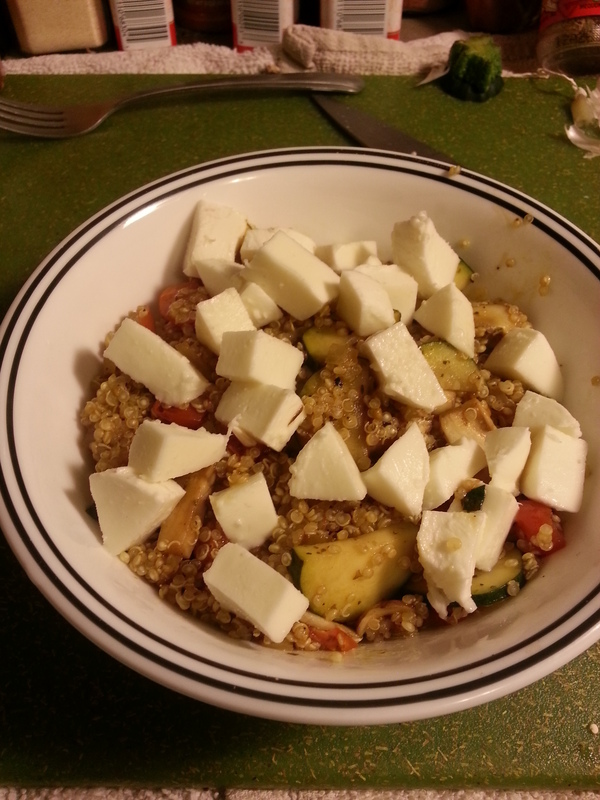 In a medium sauce pan, combine the Quinoa, Vegetable Stock, 1/2 Tbsp of Olive Oil, and 1/2 Tbsp of Red Wine Vinegar. 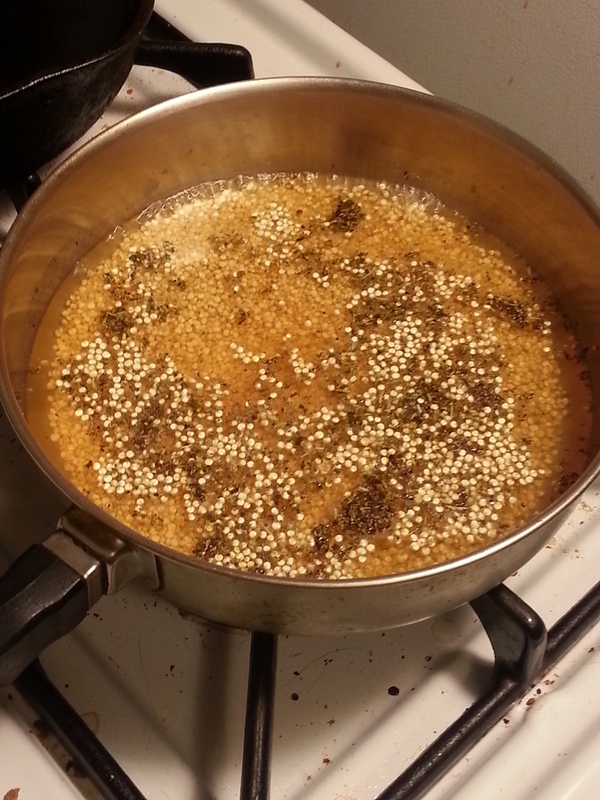 Bring it to a boil, reduce to simmer and cover for 8 – 12 minutes or until the liquid is gone and the Quinoa is tender. This can be different for everyone, I like a little more bite to my Quinoa so I don’t let it cook as long. 2. Transfer cooked Quinoa to a mixing or serving bowl and refrigerate until cold, 30 minutes or so. 3. While the Quinoa is chilling, combine the rest of the ingredients in a bowl to marinate together, then mix it into the Quinoa once it is cooled. 4. 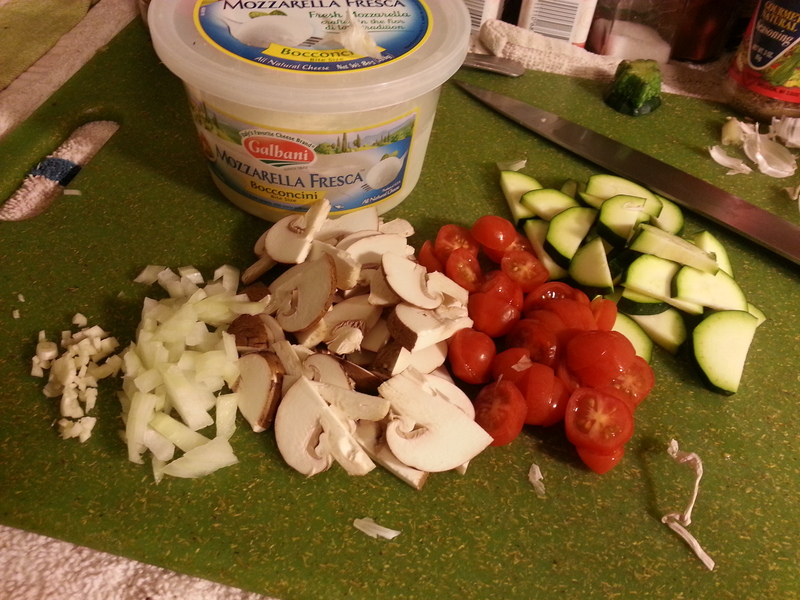 Refrigerate the finished salad for another 10 minutes and taste to check if you need more salt or pepper. Serve chilled. This recipe yields 6 – 8 servings at 7 Points Plus per serving.